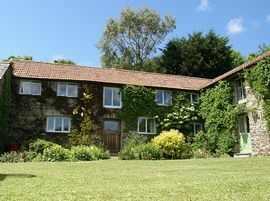 Set in a large walled garden with large (and nicely kept) lawn. The ground floor comprises three cosy bedrooms, one double (en suite), two twin bedrooms - one with full-sized bunk beds and all with sufficient space to store clothes. The family bathroom has a shower over bath, WC and wash-basin, while the en-suite to the double bedroom has a shower with WC and wash-basin. On the first floor is a light and airy open plan, comfortably furnished living-room with kitchen and dining areas. A centrally-heated, pine-floored open plan space, with windows overlooking the garden and views across the valley. Comfortable sofas and an armchair guarantee relaxing evenings listening to music, watching TV (Satellite) or just rediscovering the delights of board games and reading after dinner. The kitchen dining space, being part of the open plan area means that chef will never be lonely (or short of helpers). kitchen is well equipped to allow you to prepare gourmet meals - or just to warm up the occasional takeaway (when not BBQing in the garden. There are 8 place settings for meals - just in case a couple of friends drop in for lunch. 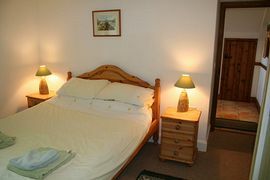 Kitchen facilities include: Electric cooker, microwave, fridge-freezer and washing machine-drier. Additional 17 acres of woodland and Meadow land to explore. 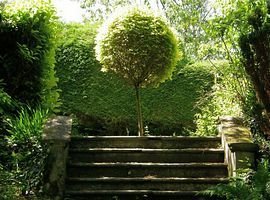 Private walled garden, secure for young children, plus a further 17 acres of woodland and meadow to explore. Local Services: West Down Village is only a mile away with an excellent shop, cafe and pub. The nearest resorts and beaches are those of Woolacombe (superb for surfing and sandcastle building), Mortehoe (for golf) and the Victorian splendour of Ilfracombe with its quaint harbour from which you can take day trips to Lundy Island. 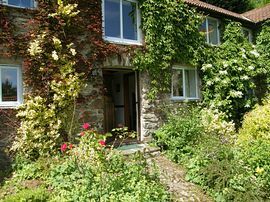 Away from the beaches North Devon offers superb walking and sites of interest from Exmoor to Clovelly. We recommend that you follow a route on the M5 towards Exeter. Take the exit at Junction 27 onto the A361 (Devon Link Road signed to Tiverton and Barnstaple). Continue for about 30 miles until you reach the outskirts of Barnstaple. At the roundabout, take the first left towards Bideford, following the signs to Ilfracombe across the new bridge. Continue on the A361 through Braunton and Knowle for approximately 10 miles. You will see the Foxhunters Pub on your right and a garage on your left. Follow the road up the hill to Dean Cross. Turn left signed to Bradwell and Willingcott (ignore the sign on the right to West Down). Continue along the lane and the fourth entrance on the left is the drive down to Buttercombe Barton.See map. 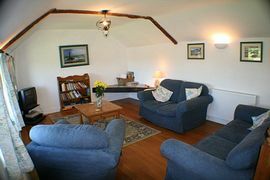 Prices start at: £460 including linen and electricity, rising to £880 during the peak weeks. Available from early April through until the end of October, for a minimum stay of 3 nights or during the peak weeks 7 nights. "Lovely cottage, lovely garden and surroundings, lovely dogs and lovely weather... thank you once again..." "...Many thanks for a beautiful accommodation and surroundings; we couldn't have wished for anywhere better..." "...The cottage gardens and surroundings are idyllic; we managed to see the deer and a tawny owl and the children loved the friendly sheep...thank you for the scones, jam and cream too"